Post your launchings, and post-launch adventures here. Please keep the to plan/date format. Having started building in November 2015, I'm relieved to say that my FS14 hit the water this weekend, and I'm delighted by her looks and handling. 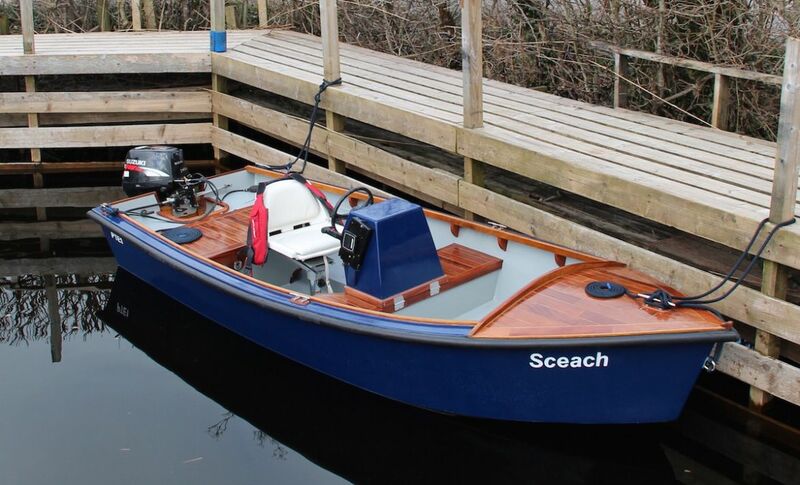 While having a bit of 'Gentleman's Launch' about her I intend to use the boat as a tender for our barge, for surveying rocky waters for charts, and for fishing, as we work up and down the River Shannon here in Ireland with our barge. I'll admit that I may have gone a bit OTT with some of the wood (it was gifted, beautiful, and had to be used...) and there's a lot more ply and fibreglass than on the plans. However, it was immediately obvious on her maiden voyage that she's immensely solid and stable, and quite capable of being circled full lock at full throttle without a murmur or a slip. She may yet prove a little too heavy for the 15hp Suzuki she was designed for as she won't quite go on the plane, but these are early days, there's lots of tuning yet to be done, and the transom is more than man enough to take something a little larger if that's the only answer. Main thing is she's finished, and a joy to both look at and use! Congrats. She is a good looking boat. What a nice looking boat. Congratulations! Completed R13 two part nesting rowboat. ST 21 under construction .... where seeking perfection is recognized as the enemy of the good. What a beautiful boat. I love it. You sure didn't waste any time building it! Beautiful - love the foredeck and brightwork! Nice. It starts with a very simple hull but you had fun with the finishing touches. To hold onto the rear bumper of a car and ski on your sneakers. The kids were sceeching on the block. Did you mean that? If so, you will need a bigger engine!!! She is definitely a Beaute.